My 2011 Breeders’ Cup Betting Guide is now available for purchase. In it, I offer early analysis of all 15 Breeders’ Cup events. Readers will also receive information on past trends and stats, along with articles on “big” winners, “freshened” horses and more. 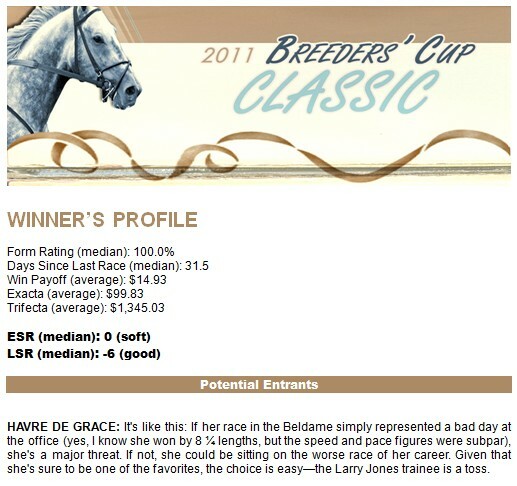 With each purchase of “Derek Simon’s 2011 Breeders’ Cup Betting Guide,” one will also receive links to free Win Factor Reports and Pace Profile Reports for the BC races. Get your copy today… or tomorrow… or even on Friday — just be sure to get it! Click HERE to order your copy (please write me with any questions or contact me via Facebook).